* Starts with a spicy citrus burst of orange and grapefruit, covered with cinnamon, and sharpened with a touch of cedar. * With those top notes it feels surprisingly dense – this isn’t a cologne-style citrus, but a cloud that surrounds you. * The citrus gets sweeter as an earthy patchouli comes in. * That incredibly dense feel of the top continues and actually starts to make the scent feel a bit muddled. * Luckily, when the base comes in it gets a lot better. The amber woods with a touch of sweetness and booze are really nice and almost makes the scent worth wearing. Summary: When I first got this scent, I absolutely loved it. I am guessing over the past few years my tastes have changed. I tried to figure out the right word to describe it and I came across Victoria’s description on EauMG when she called it milky. That’s exactly it. It’s not that I don’t like like milky scents (I love Join the Club Shun Koin) – but just like orange juice is great with cereal and milk – the idea of mixing milk and orange juice together in one drink is disgusting. That’s how it reads on my skin. I haven’t worn this in a while and will probably sell my bottle. I guess I need to go back and revisit CN Scent Intense as well. A lot of people really like CN Homme and it’s worth testing – especially as a designer scent that is unique. It is really long lasting (more than 12 hours) with strong projection – not office friendly and more for nighttime. 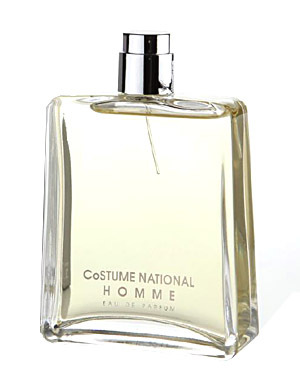 Costume National Homme is available from Lucky Scent. Disclaimer: No disclaimer needed, I own a full bottle. Image courtesy of Lucky Scent.